First Impression | This was really new to me. This product has sort of a triangle shape to it, but I'm used to just a point (like the ABH Brow Wiz). I guess I just have to get used to it. Other than that, it has good colour pay off and I'd say it's more creamier than the Brow Wiz, that tends to pull some of my brow hairs occasionally. Review | Definitely replaced my other eyebrow pencils. I almost never use my Brow Wiz or the NYX brow pencil. I find that this product is faster to use and is much more creamier than both of my other brow pencils. I recommend this if you're looking for a new one to try. First Impression | The texture is similar to a MUFE primer that I have. It applies smoothly. 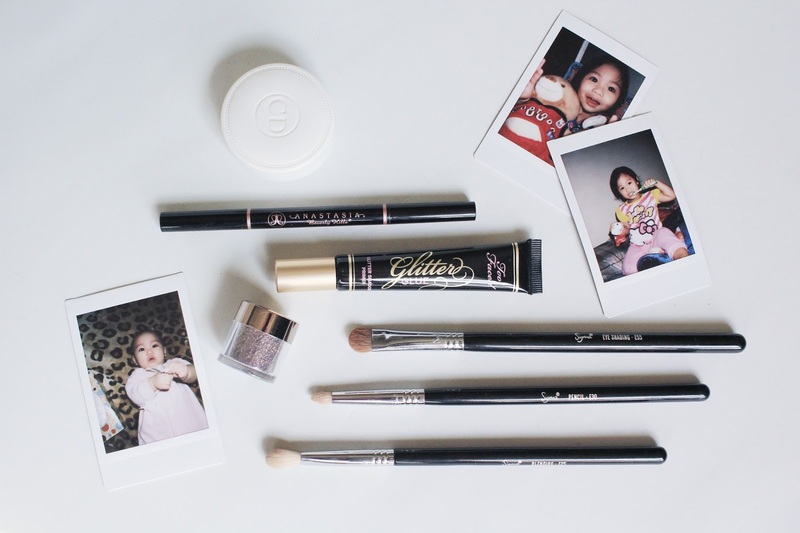 Review | This is the first glitter glue that I've tried and I think it's amazing. It actually kept my glitter on for the whole wear. The glitter adheres to this product really well. First Impression | Very messy packaging. Once I opened it, glitter was everywhere. Review | The glitter is really beautiful. I bought the shade Satellite and it's really nice. Like I said, without there being a sifter, it gets extremely messy and you lose a lot of product because of it. Application wise, it's good paired with the Too Faced Glitter Glue. I use a tissue to shield my under eyes from catching any fallout, I feel like that's a necessity. Click here to see last month's reviews.